Accounting with BadgeBox becomes simple. It takes a tap or a click to create new invoices or enter incoming invoices and create notes. This function allows to keep track of a monthly, bi-monthly, quarterly, semi-annual or annual budget. The invoice creation process is an intuitive one that uses latest stored settings in order to automate the data insertion and speed up proceedings. 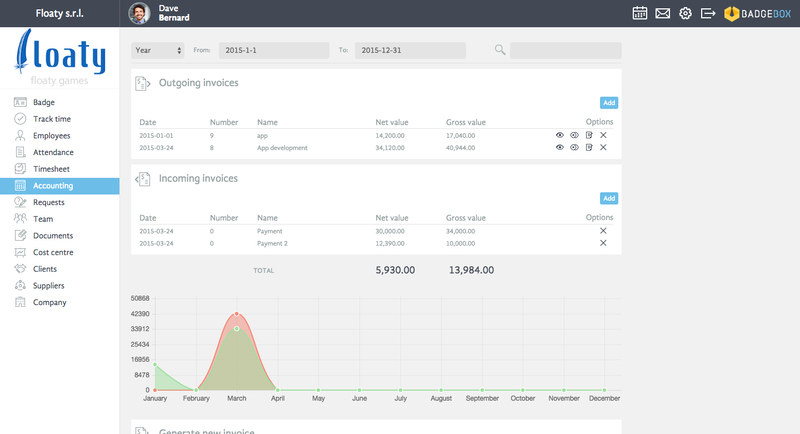 As you can see in the picture, in this section you can visualize existing incoming and outgoing invoices for the selected period of time (year, quarter or custom) as well as expenses. The process of generating a new invoice or expense is quite simple. All it takes is to click on the “Add” button and fill in the required fields. In order to have under control all costs, on the right, there is the “Expiring” list that contains all invoices that need to be paid. This way you can always know your upcoming payments. The graph bellow invoices and expenses represent a graphic visualization of all costs and incomes that allows better management.